Let's get this point out of the way right now - just because your opponent is a higher level Builder's Hall doesn't mean you cannot compete. True - a brand new BH5 vs a well heeled BH6 is pretty much always going to turn out as a loss for the BH5. That isn't typically the kind of match up you get, though. These may shift a bit periodically, but they seem to have held fairly steady these last few months. Now, the first question to ask - why on earth would BH6 players be down in the 1000s and why should I have to fight them as a BH4 or BH5??? In some cases, these players are still in the early stages of their rush to BH6. In others...well...they're just not very good at the game. 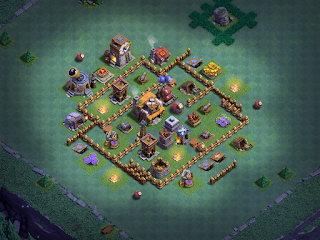 In both cases, you'll typically find that they have lower level troops and defenses. Although they have more on the game grid and you'll have to take out more structures to earn the same percentage, their weaker structures go down more quickly and are easier to take out. Their weaker troops will struggle against your structures as well. Of course, the tangent to this question - if BH5's sweet spot is 2100-2700, how come I can't get my BH5 any higher than 2200? All of my BH5 games have lived in the 2500-2800 trophy range within a couple weeks of upgrading to BH5. They came from near-max BH4 games, so they already had decent defenses and troops and the competition at the lower BH5 trophy rankings just wasn't very hard to beat, even with BH4 troops. The BH6 games I was fighting were all weaker BH6 games with level 3 through level 5 defenses and typically level 8 to level 10 troops. Is this unfair? Not really - I beat these guys all day long. And I didn't just beat one or two, here and there - my games fought nearly ONLY BH6 games and I had 6 BH5 games going at one time, so we're talking 18 wins every day against these "stronger" opponents. If you find yourself drawing more difficult opponents and actually losing, though, you need to look at the losses and your game's progress. Have you taken most of your defenses to max for your BH level and are the troops in your key attack strategies also maxed for the BH level? Are you at the upper range of the trophy ranking sweet spot I mention above? If so, then it might be time to upgrade to the next BH level. The BB game does not penalize rushing like the main game used to; it's typically a stronger path forward on the BB. In any case, don't let it get you down or thinking the game is unfair. It's just the current meta, something that changes daily and weekly. Your game is much stronger than you think and you're almost certainly a stronger player as an underdog. Keep plugging away and you'll get there!